I was born in 1974 in Kashiwa City, Chiba Prefecture in Japan. I am a photographer taking photographs of sceneries and portraits under the theme of “Kizuna” a feeling of attachment, as a main theme. I love both taking and appreciating photographs, and I feel joy in doing so. I believe it is a gift sent from God. In my student days, one of my friends brought his camera to the class to take photos for a yearbook. I had a chance to get hold of his camera and peep through a finder. I was flabbergasted. The vague scenery turned to take clear shape with the adjustment of the focus. I was excited by the experience. I soon bought a SLR camera of my own. I only had 50mm lens in f1.4. At that time, I thought it was a great combo that enables me to take everything with it. Even peeping the finder was a sheer joy. I started to take photographs of the people beside me, the neighborhood, and a nearby pond called Teganuma where I used to go fishing and played in my childhood with my family. I started out studying photography on a self-study. As my interest grew, I soon felt the limitation in my ability and desire to be taught by experts started to grow. 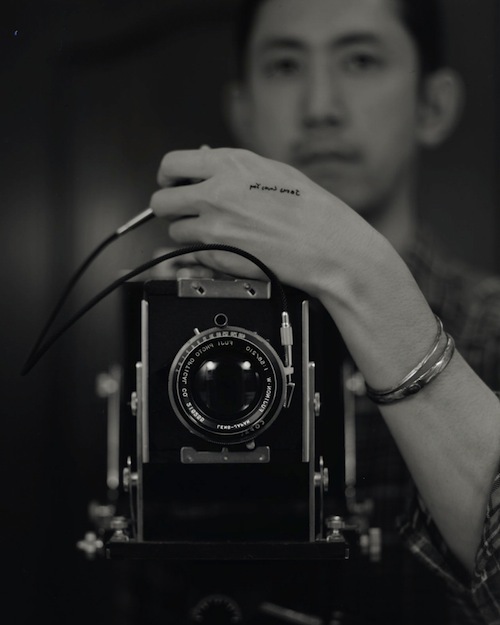 I searched the web and found a photographic workshop called 2B held by a famed photographer Satoru Watanabe. I decided to learn photography from scratch. The lessons I attended were quite comprehensive. I learned how to calculate exposures, do darkroom works on monochromes and color prints, operating digital-camera, viewing photo, exhibiting photo and much more. I started to enjoy shooting more freely and facing a failure has become a pleasure from the words of Mr. Watanabe: “Even a failed photograph is a photograph, so enjoy the freedom"
I seek to take photographs that remind the feeling of Kizuna (an attachment) with the world in the minds of the viewers. I capture the feeling of anxiety and solitude in life without Kizuna, and the feeling of peacefulness and calmness in life with Kizuna. I take photographs of the world to materialize my photographic theme. I find the world is comprised of people, community, nature and the universal existence that I feel behind them. I am greatly interested in the world and I would be delighted to make bond with the various existences in this world. In addition, I am attracted by the tranquil view. I have a moment when I recognize the universality in each individual existence of the daily life that we often ignore. I regard such view to be my object for shooting. The view may be scenery or person. My works are expressed in black-and-white. I used to take photographs in color but I began to realize that there were not any color that held appeal for me. On the contrary, what I find attractive was the existence of the object in front of my eye and I recognized that color was not a critical factor in my work. I sometimes use long exposure time. It is done to close in the flow of time and to blunt the sense of time. I believe it is effective in expressing the universal world without the past and the future. If it is waterside scenery, surface of the water levels out and the tranquility could be obtained. I am aiming to create a photograph that makes the viewers want to touch. Therefore I have chosen, over the silver paper printing, the ink-jet printing with wide selection of unique quality of papers. I will continue to take photographs of the world that I am interested in and be delighted with having a bond with this world. I also would like to duly accept the fact that there sometimes lies difficulty in bonding with the world. It is my sincere desire to share the attachment that I felt through my photographs with the viewers and establish kizuna with them. Copyright © 2007-2015 Kazuaki Nozawa. All rights reserved.